am on September 11, 2001, 14,000 people were inside the twin towers-reading e-mails, making trades, eating croissants at Windows on the World. Over the next 102 minutes, each would become part of a drama for the ages, one witnessed only by the people who lived it-until now. Of the millions of words written about this wrenching day, most were told from the outside looking in. New York Times reporters Jim Dwyer and Kevin Flynn have taken the opposite-and far more revealing-approach. Reported from the perspectives of those inside the towers, 102 Minutes captures the little-known stories of ordinary people who took extraordinary steps to save themselves and others. Beyond this stirring panorama stands investigative reporting of the first rank. 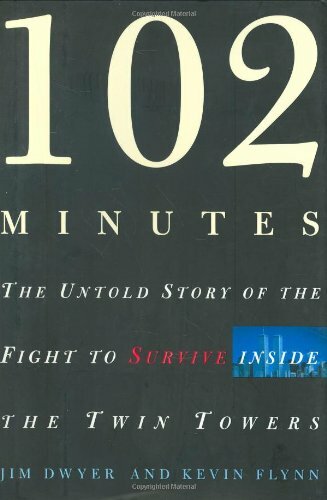 An astounding number of people actually survived the plane impacts but were unable to escape, and the authors raise hard questions about building safety and tragic flaws in New York's emergency preparedness.Dwyer and Flynn rely on hundreds of interviews with rescuers, thousands of pages of oral histories, and countless phone, e-mail, and emergency radio transcripts. They cross a bridge of voices to go inside the infernos, seeing cataclysm and heroism, one person at a time, to tell the affecting, authoritative saga of the men and women-the nearly 12,000 who escaped and the 2,749 who perished-as they made 102 minutes count as never before.Â 102 Minutes is a 2005 National Book Award Finalist for Nonfiction.